Sally points to the dilemma in which all human beings live – that our insides and our outsides do not match up all that well. We can put on a good front (in public) but under our facade – there is pain and brokenness. That is the human condition. In the Gospel reading for today, Jesus tells a parable. A parable, by its’ very nature, is a story which contradicts and brings into question a commonly held belief. Jesus says, “What do you think? A man had two sons. He said to the first – go and work today. The son said, ‘No,’ but later he went and worked. The man said to his second son, go and work today. The son said, ‘Yes, I’ll go.’ But he never go there. 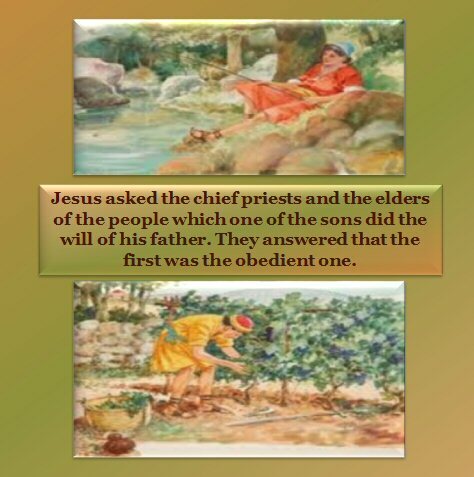 Which one did the will of the father.” “The first one.” “I tell you that harlots and tax-collectors will go into the Kingdom of God before you.” That harlots and tax-collectors would make it into the Kingdom at all was a shock. But that they would get in before the good religious folk was a deeply contradictory thought for them. God’s call to us, as it was to them, is a call to attentive consciousness. Religious people are qualitatively no different from sinners. Nobody’s insides really match their outsides. The difference was that the sinners were conscious of their brokenness and the religious folk were not. Frederick Beuchner says that, “the Gospel is always bad news before it is good news.” The bad news is that the Kingdom of God is not ours on our terms. The Good News is that the Kingdom’s terms are better. What does this say to us? We Christians find it fairly easy to make our outsides look good (at least when we think folks are looking). But that is the easy part. In our honest moments we admit that each of us is broken – that in us are deep contradictions – the dark and the light, good and evil, sin and virtue. In the midst of our very best intentions we find the shadow. St Paul writes in his letter to the Philippians, “ 5 Let the same mind be in you that was in Christ Jesus, 6 who, though he was in the form of God, did not regard equality with God as something to be exploited, 7 but emptied himself, taking the form of a slave, being born in human likeness. Now, to our way of thinking, when we hear the word, “form” we think in terms of shape. The form of something is the shape it takes. This was not so for the Greeks. To their way of thinking, the word, “form” refers to the outward expression a person gives to his or her innermost nature. This is not assumed or varnished on the outside but proceeds from the inside, so that the outward form is a genuine expression of the inner reality. What Paul is saying is that the glory of the Father is a genuine expression of Jesus’ nature but that he put aside the outward expression of glory and by his birth as a human being he put on the outward expression of servant hood. He was not pretending to be a servant, but rather servant-hood was as much a genuine expression of Jesus’ inner nature as glory. For example, what Paul describes in his letter to the Church at Philippi is the opposite of what happened to Jesus on the Mountain of Transfiguration. Jesus and three disciples went up the mountain. There as Jesus prayed he was transfigured. For a moment the outward expression of a servant was replace by glory. In this computer age we might say, his outward form of servant defaulted to the outward form of glory. The account says that his face and clothing were brilliantly bright. Both glory and servant-hood are genuine expressions of who God is in Christ Jesus. Jesus was consistent all the way through his being – without contradiction. How do we have this mind? The most basic and continuing step is to become conscious of who we are and who we are not. Then the process of integration begins and continues. We must be conscious of our inner contradiction. This is painful and our natural reaction is to avoid such a state of being. When faced with our inner brokenness we often do one of two things: We ignore or deny our condition. Grace comes not by denial or ignoring. Graces comes when we face our brokenness, acknowledge our shadow. The tension of facing our contradictions opens a crack in the shell of our ego and grace seeps in. We bring ourselves, the good and bad, to the Holy One and ask for healing. The process of healing/salvation is that over time our insides and outsides can both reflect the new life that is ours in Christ Jesus, our Lord.